Special Counsel Robert Mueller completed his investigation into Russian interference in the 2016 election on Friday, according to the Justice Department. The long-awaited final report on the contentious Russia investigation has consumed the nation, cast a dark shadow over Donald Trump‘s presidency and resulted in criminal charges against some of the president’s closest associates. 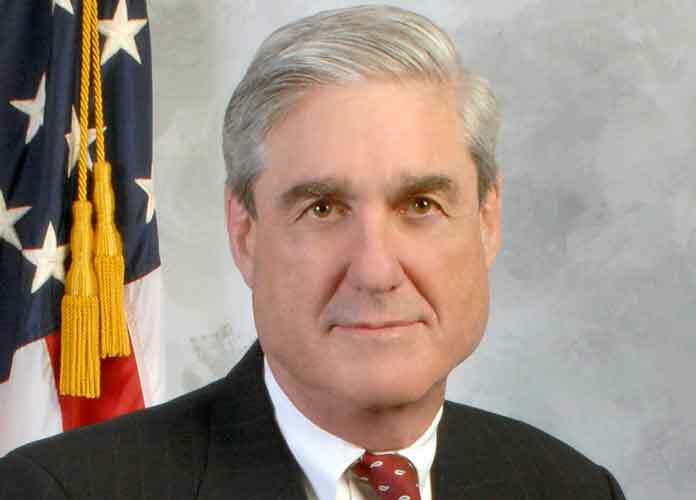 The report will now be reviewed by Attorney General William Barr, who will write his own account communicating Mueller’s findings to Congress and the American public. Barr told congressional leaders that he may brief them within days on the special counsel’s findings. 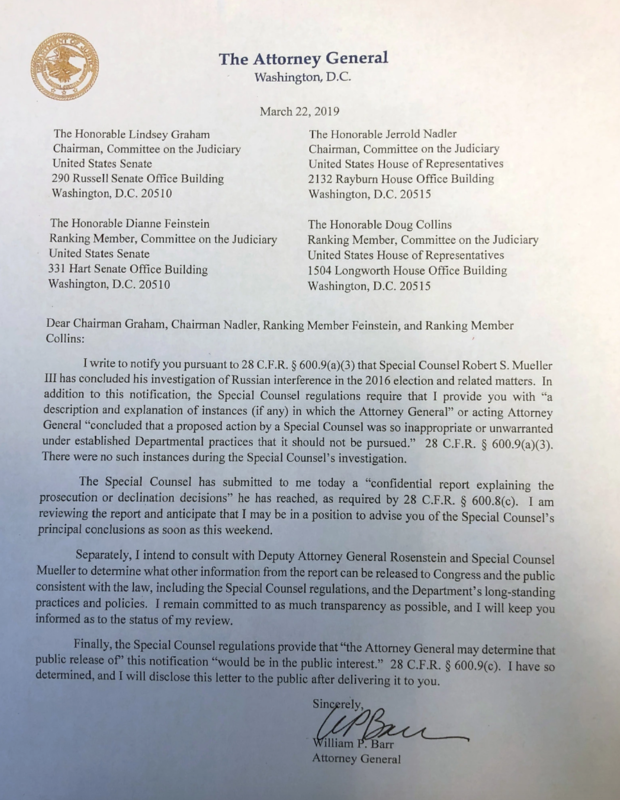 “I may be in a position to advise you of the special counsel’s principal conclusions as soon as this weekend,” he wrote in a letter to the leadership of the House and Senate Judiciary committees. It is up to Barr how much of the report to share with Congress and the public. The House voted unanimously earlier this month to make the report’s findings public, an indication that both parties want to air whatever evidence prosecutors uncovered. With no further details released at this point, it’s not known whether Mueller’s report answers the core questions of his investigation: Did Trump’s campaign collude with the Kremlin to sway the 2016 presidential election in favor of the celebrity businessman? Also, did Trump take steps later, by firing his FBI director, to obstruct the probe? Since Mueller’s appointment in May 2017, his team has focused on how Russian operatives sought to sway the outcome of the 2016 presidential race and whether anyone tied to the Trump campaign cooperated with them. While the inquiry unearthed Russian influence, no public evidence has emerged that the president or his aides illegally assisted it as of yet. Nonetheless, the damage to Trump and those in his circle has been extensive. The nearly two-year probe has resulted in charges against 37 people, including a half-dozen of former Trump aides. The list of officials in Trump’s orbit who have pleaded guilty in Mueller’s probe is lengthy, including former Trump campaign chairman Paul Manafort, former Trump White House national security adviser Michael Flynn, former Trump personal attorney Michael Cohen, former Trump campaign deputy Rick Gates and former Trump campaign adviser George Papadopoulos. Longtime Trump confidant Roger Stone was charged in January with obstruction, false statements and witness tampering. He has pleaded not guilty and is awaiting trial. Dozens of Russian intelligence officers and citizens, along with three Russian companies, were charged as well. Even though under current Justice Department policy a sitting president cannot be indicted, Trump’s lawyers worried that his responses could bring political repercussions. While Mueller’s report is complete, recently filed court documents suggest that investigators are still examining why Manafort turned over campaign polling data in 2016 to a Russian associate tied to Russian intelligence.